I can't help it: the image in the previous post of the cockpit instrumentation (including my iPad) I now take for granted made me go back to my original flying diary to find this image of 12R's panel back when I was learning to fly. 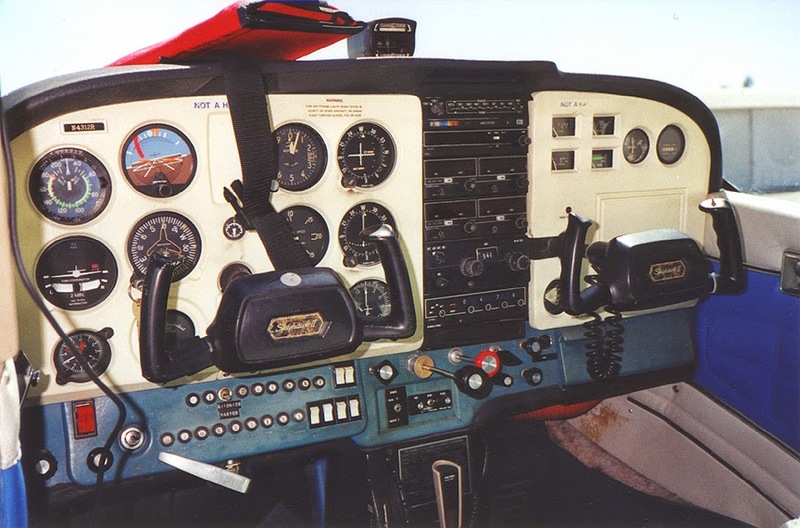 Not exactly state of the art even then, but still, a pretty representative Cessna 172 panel from the late 1990's (12R's panel might even still look like this for all I know). Returning to Oakland in a DA42 last week, we noticed traffic being displayed on the MFD at our 1 o'clock. As we got closer, we got the aircraft in sight just as Oakland Center gave us a traffic advisory. It was 12R! My wife was with me and we recalled how we had flown 12R to San Diego and back about a dozen years ago. I can't vouch for what 12R's panel looks like now, but she's still flying!